The Chihuahua is a graceful, alert, swift-moving, compact little dog with a saucy expression and terrier-like qualities of temperament. Manchita (the name of the perfect Chihuahua described throughout this article) is compact, feels solid in your hands, and appears well proportioned — not long of body or lanky or too tall. She has terrier-like qualities; she’s confident, animated, spirited, curious, and interested in everything happening around her. 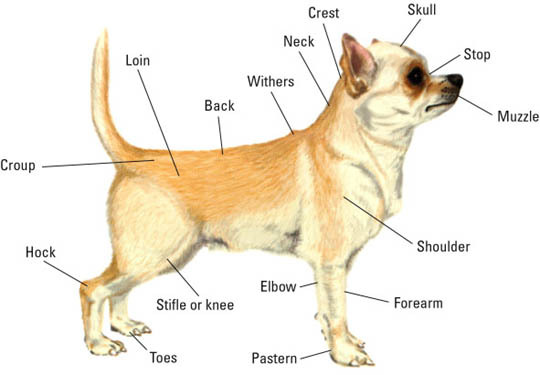 Figure 1: Parts of the Chihuahua. In general, many breeds are considered square, meaning that their height is the same as their length. But the Chihuahua is supposed to be just a little longer than it is tall. The reason a little more length is desired in females than it is in males is because females need the extra space to carry puppies. A Chihuahua needs a balanced appearance. That means every part of its body must be in proportion with its other parts. If its legs appear too long for its body or its head appears too small for its neck, the Chihuahua looks like it’s made from spare parts. To meet the standard, the shape of Manchita’s head looks sort of like an apple — rounded but not completely round. If she has a molera, you’ll feel a slight indentation, like the soft spot on a baby’s skull, when you gently stroke the top of her head. Her eyes are better if they’re large, set well apart, radiant and shiny — not close together, protruding, smallish, or dull. For perfect proportions, the middle of the eyes lines up with the lowest part of the ears. If Manchita has ideal ears, they’ll be at a 45-degree angle to her head when she’s resting, but come to attention, held high, when she’s alert. Manchita may also flatten them against her skull when she’s moving fast or when something makes her uneasy. Chihuahua ears must be left as nature made them. Cropped ears (surgically shaped or shortened ears) are not permitted on Chihuahuas in the show ring. A Chihuahua with broken ear cartilage, resulting in a droopy or lopsided ear, is grounds for disqualification from showing. How a dog holds its ears (for example, alertly erect or relaxed), is called its ear carriage. The standard calls for a muzzle, or snout, that is moderately short, but that doesn’t mean shorter is better. A super-short muzzle is incorrect in the Chihuahua. That’s because extremely short muzzles can cause breathing problems and crowd the teeth. Ideally, the muzzle should emerge from the skull at a right angle. If Manchita’s upper front teeth meet tightly outside her lower front teeth, she has a scissors bite, while if her upper and lower incisors (front teeth) meet flush with each other when her mouth is closed, her bite is level. The scissors bite is the strongest bite and is considered ideal. Also, the teeth wear down faster when the bite is level. An attractive neck from a side view flows smoothly and gracefully into your Chihuahua’s withers (top of her shoulders) without wrinkles or folds. Ideally, her neck is of medium length. A short neck may be the result of improperly placed shoulder blades, which prevent Manchita from moving well. Besides, if her head appears to be attached directly to her shoulders, she’ll look unbalanced and front-heavy. On the other hand, an extremely long neck may be a sign that a dog lacks substance (appears weak). It may be accompanied by legs that are too long legs and a lanky body. Look for graceful lines. All the dog’s parts should be well balanced in relation to one another. Manchita’s topline flows along the top of her back from the withers to the root of her tail (where the tail meets the body). Ideally, it should be level or straight, without a dip in the middle or a downward or upward slope. Manchita’s body appears rounded rather than flat along the sides, and she needs a roomy rib cage to house her heart and lungs. Chihuahuas have three correct tail positions and one incorrect: sickle up, sickle out, loop, and the sorry-looking tail-tuck (see Figure 2). When a Chihuahua puts its tail between its legs, something is wrong. The dog may be timid, frightened, cold, or sick. A cropped tail or bobtail disqualifies a dog from the show ring. Figure 2: Three correct tail positions (and one sorry tail tuck). A dog’s conformation is the shape of her body from the top of her head to the tips of her toes and tail. It encompasses balanced body proportions and size, both of which need to be correct for the breed. Chihuahuas come in two varieties — smooth coat and long coat. If Manchita has a smooth coat, her hair is short and close to her body, and she may or may not have an undercoat, or a protective layer of shorter fur underneath the outer or top coat. A smooth Chihuahua that has an undercoat appears more thickly coated than one that doesn’t, and usually has a furrier tail and a ruff of thicker hair around its neck. If Manchita has no undercoat, her hair is sparser. In fact, it may be so thin that she appears nearly bald on parts of her head, ears, chest, and belly. Don’t worry. It’s not a problem. The thin coat simply means she’s a smooth Chihuahua without undercoat. If Manchita, on the other hand, is long coated, she has an undercoat and her outer coat is between an inch and an inch-and-a-half long. Her ears are decorated with longish hair called fringe or feathering, and she has an abundant ruff around her neck, long hair called a plume on her tail, and wispy hair on the back of her legs. She also sports natural pants — long hair on her buttocks. Aside from that, she should look exactly like a smooth Chihuahua, because the two varieties have exactly the same conformation (body structure) underneath their coats. A sparse coat disqualifies only long-coated Chihuahuas from the show ring. Short-coated dogs with thin hair are considered normal, although a thicker coat usually is more attractive. Any color — solid, marked, or splashed, take your pick — and all colors or combinations of colors and markings are acceptable in Chihuahuas, and none are considered better or worse than others. Check here for information about selecting a chihuahua puppy.